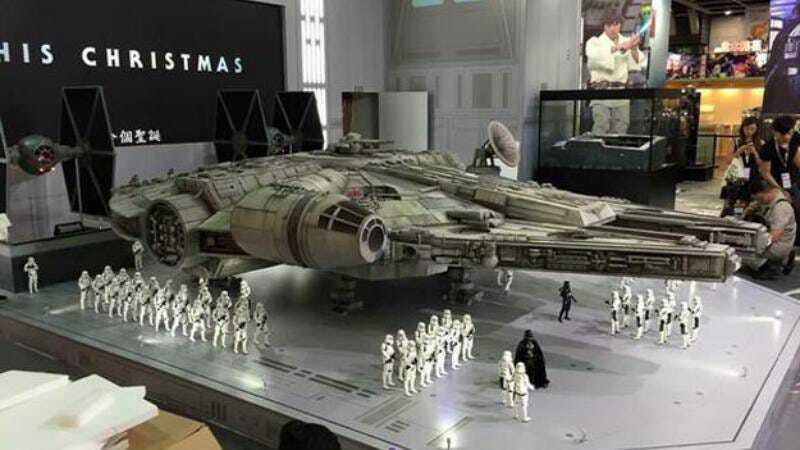 Threatening to disrupt the often-delicate domestic harmony of collectors living with non-collectors, Hong Kong-based toy company Hot Toys is expected to unveil a 1/6th scale replica of the Millennium Falcon at a comic-con in the Chinese city over the weekend. For those who can’t recite the Falcon’s dimensions from memory—and who therefore probably have no business buying a 1/6th scale model of the thing—that measures out to about 18 feet by 12 feet, or the exact dimensions of that room in the basement that the husband was going to turn into a carpentry workshop, but never did, so it seems like fair game at this point, and why is he making that face? Luckily for these long-suffering spouses, Hot Toys hasn’t announced any plans to sell the 18-foot Falcon commercially…yet. But be prepared to start parking on the street if they do. Garage’s full.